A Chetan Bhagat novel is akin to reading a screenplay. You start visualizing the characters, the occurrences and episodes, the myriad emotions… like it were occurring in front of your eyes. What also makes Bhagat’s novella interesting are its characters and the fact that they are hugely identifiable since they are based in India. After ‘one night @ the call center’ [HELLO] and ‘five point someone’ [3 IDIOTS], the author’s much-talked-about novel ‘the 3 mistakes of my life’ gets picked up for the big screen adaptation called KAI PO CHE. 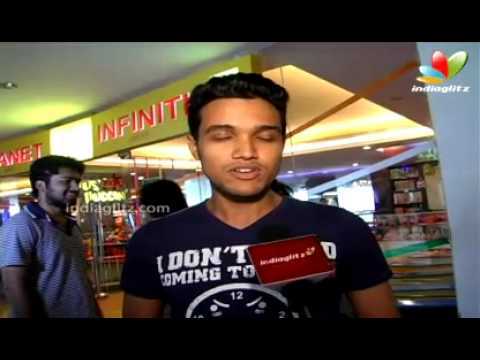 So what does the title [KAI PO CHE] mean, a question I have been asked more than a few times by cineastes. Translated simply, it’s a call of triumph in Gujarati, when one kite flier cuts another’s kite. Besides sounding different to the ears, the title metaphorically suits the premise of the story that’s set in Gujarat. And how close is the motion picture to the much-acclaimed novel? Well, the episodes and characters are the same, except that Abhishek Kapoor tweaks and fine-tunes it [adapted for the screen by Pubali Chaudhuri, Supratik Sen, Abhishek Kapoor, Chetan Bhagat], since the medium is cinema. KAI PO CHE cannot be slotted in any particular genre, in my opinion. It depicts unconditional friendship, it portrays bromance as well as romance, it illustrates politics, it exemplifies the passion for a sport [cricket], it talks of the events that unfolded in Gujarat [earthquake, Godhra massacre and the riots]. Multi genres, you could say. But, at heart, KAI PO CHE remains an emotional saga of three friends and how it stands the test of time. Very similar in spirit to the director’s previous outing ROCK ON!, Farhan Akhtar’s DIL CHAHTA HAI and Zoya Akhtar’s ZINDAGI NA MILEGI DOBARA, yet different. In KAI PO CHE, Abhishek brings alive the characters and events most persuasively. He borrows from the novel, but at the same time adds a lot to it with his deft execution. Resultantly, what emerges is a movie that evokes myriad emotions in the viewer. You smile, chuckle, get anxious and jittery, also moist eyed on several junctures. Attention-grabbing in entirety, absorbing you into its world from the onset itself, KAI PO CHE blends fiction and facts dexterously, recreating a story on celluloid that’s credible and noteworthy. KAI PO CHE narrates the story of three friends and is based in the city of Ahmedabad. The plot sees a young boy in Ahmedabad named Govind [Rajkumar Yadav] dream of starting a business. To accommodate his friends Ishaan [Sushant Singh Rajput] and Omi’s [Amit Sadh] passion, cricket, they open a cricket goods and training shop. However, each has a different motive: Govind’s goal is to make money; Ishaan desires to nurture Ali, a gifted batsman; Omi just wants to be with his friends. The events that transpire against the backdrop of all that occurred in the city during that time change the lives of each of the friends in very different ways. Abhishek Kapoor has the trappings of a first-rate storyteller — a fact that was evident in his first two endeavors [ARYAN, ROCK ON!]. In several ways, ROCK ON! and KAI PO CHE are analogous, yet divergent. While ROCK ON! was urban and metro-centric in terms of content, KAI PO CHE has the raw emotional appeal of three middle class guys that strikes a chord with just about anybody and everybody. In any case, a film like KAI PO CHE is damn difficult to make. It has several layers and sub-plots… a bigger canvas actually. And like I pointed out at the outset, it encompasses not just the story of three friends, but also real incidents that send a shiver down your spine. Abhishek gets out of the comfort zone to attempt a daringly different movie. Also, with KAI PO CHE, the supremely talented craftsman takes giant strides as a film-maker. What’s truly credible is the fact that he doesn’t follow the rules or diktats prescribed by his peers in Bollywood. Instead, he charters a path that’s pure and uncontaminated. Also, he opts for relative newcomers this time [casting director: Mukesh Chhabra], which could’ve boomeranged if the actors were incapable of infusing life in their respective characters. After ROCK ON!, which had a lilting soundtrack, KAI PO CHE too has a winning musical score, composed by the inimitable Amit Trivedi. The songs are uncomplicated and mirror the spirit of the film wonderfully. More importantly, it’s an unadulterated Indian soundtrack, not a cacophony of tunes put together to western beats. Swanand Kirkire’s lyrics are poignant and leave an impression. The background score [Hitesh Sonik] is subtle where required, but electrifying when necessary. Anay Goswamy’s cinematography is top notch, capturing the emotions as well as the rustic atmosphere to perfection. The three pivotal parts, enacted effortlessly by Sushant Singh Rajput, Rajkumar Yadav and Amit Sadh, are the heartbeats of the enterprise. Sushant is a terrific actor, is blessed with wonderful screen presence and gets the timing of his character right. I see tremendous potential in him! Rajkumar Yadav has proved his credentials in the past and shines yet again in a role that’s in sharp contrast to the other two characters. He’s excellent! Amit Sadh is another remarkable talent to watch out for. Sure, he too has a couple of films to his credit, but his performance in this film will make people notice him. Besides, their on-screen camaraderie is truly infectious. Amrita Puri leaves a strong impression in a movie that’s an all-boys’ show predominantly. The supporting cast is equally super. Manav Kaul is magnificent, taking his character to another level. Asif Basra does a splendid job. Digvijay Deshmukh [as Ali] is a revelation. He’s incredible! On the whole, KAI PO CHE is brimming with solid content. Watch it for the spirit it is made in. Watch it because it’s the kind of cinema that pushes the boundaries. Watch it because movies like KAI PO CHE need to be encouraged. A film that deserves an ovation! Though spoken in jest, these words reveal a shrewd oxymoron of ambition and reality that characterises the zeal and anxiety of the youth. And to me, this stunning clarity and ease in director Abhishek Kapoor’s voice is what makes this adaptation of a mediocre novel so irresistible. I wouldn’t call Kai Po Che an exact retelling of Chetan Bhagat [ Images ]’s The 3 Mistakes of My Life. Kapoor clearly recognises the strengths (and limitations) of this story as a motion picture and labours to compound an emotionality worth rooting for even if it means significant departure from the source. It’s a beautiful risk. And it totally works. Along with Pubali Chaudhari, Supratik Sen and Bhagat, he alters the book’s populous contents to create a solid focal point and tell a cohesive tale of remarkable friendship set in Gujarat’s largest city, Ahmedabad [ Images ], marked by three real-life events — a propitious cricket match between India [ Images ] and Australia [ Images ], a natural calamity and communal riots. How these experiences test their relationships and mould their conscience is documented through the vibrant highs and consuming lows of Kai Po Che. Unaffected and free-flowing, the bond between Govind (Raj Kumar Yadav), Ishaan (Sushant Singh Rajput) and Omi (Amit Sadh) has such a ‘lived-in’ quality to it, there’s no problem buying the film’s ‘brothers for life’ tag line in a heartbeat. They talk very fast when communicating with each other, but this breathless incoherence (indicating informality and comfort) adds to their appeal. Govind is the enterprising, cautious but reticent leader of the group. Omi, unlike the bright orange he sports, is subdued, susceptible and yet to come into his own. Though hotheaded and impulsive, Ishaan wins everyone over with his infectious smile and dynamism. His overpowering desire to coach extraordinarily gifted local kid Ali (Digvijay Deshmukh) into a full-fledged batsman, Omi’s political affiliations with his maternal uncle (a compelling Manav Kaul) and Govind’s clandestine affair with Ishaan’s impish kid sister, Vidya (a super cute Amrita Puri) advance steadily to converge into Kai Po Che’s culminating point. Because of the varying motives of these individuals, the screen is continuously buzzing with disparate moods. But Kapoor, like vehicle suspension, provides a stability and homogeny to these activities so as to identify with, not overwhelmed by this interconnect. Govind, Omi and Ishaan are no Jai-Veeru in magnitude but the sincerity of their can-lay-my-life-for-you ardor is noteworthy. They jiggle to Chaalbaaz’s Aaj Sunday hai toh daaru peene ka din hai, fool around shirtless at the picturesque Diu fort like those Rang De Basanti [ Images ] lads, enjoy the carefree breeze by climbing on top of a moving bus and –embrace and abuse both, without hesitation. Quoting from Bollywood, impromptu excursions and taking each other for granted without guilt is the prerogative of buddy-dom and this wholehearted demonstration is radiantly captured in cinematographer Anay Goswamy’s sun-soaked compositions. The combination of Swanand Kirkire’s breathtaking lyricism and Amit Trivedi’s exquisite melodies reiterates the troika’s exuberance and idealism. As typical to this genre, any celebration of brotherhood must be put on trial whether it’s Dil Chahta Hai’s [ Images ] Akash and Sid, Rock On! !’s Aditya and Joe, Middleearth’s Frodo and Sam or, heck, even Shrek and Donkey. Kapoor doesn’t have a novel situation in hand but his approach to it is. The vibe of Kai Po Che is decidedly more down-to-earth and so he treats the truce with endearing spontaneity that is familiar to most hysterical cricket enthusiasts (that makes a LOT of us). Such a glorious moment! A heartfelt smile is the only immediate compliment I could offer. Unlike most films that go overboard reminding us which region they are set in, Kapoor, thankfully, steers clear from the dhokla/fafda clichés (okay, so there’s a passing mention of thepla/khakhra). His characters, Govind in particular, speak with a slight, acceptable accent while the gorgeous Dandiya [ Images ] sequence plays on the opinion that a huge percentage of young couples get sexually active in the garb of festivities. But the real task is not to offend sensibilities while filming a sensitive subject, like the Gujarat earthquake or riots and the terrible damage of life and property it resulted in. Kapoor depicts it powerfully (background score by Hitesh Sonik delivers here its best) but realises intelligently that any more drama would borderline on exploitation. There’s no attempt to make any political statements and most of the religion-driven hostility is implied not outright. Thought the pre-climax of this crisply-edited (Deepa Bhatia) drama does underscore the futility of blind blood thirst and aggression. Turning a far-fetched plot into a probable one is laudable but Kai Po Che (It’s a Gujarati phrase exclaimed by the one who succeeds in cutting off the competitor’s kite) wouldn’t achieve half of this without its dead-on casting (Bravo, Mukesh Chhabra). The few films old Raj Kumar Yadav gets the tone of a soft-spoken go-getter, who’s nervous around girls and diplomatic around clients just right. It’s not a showy part. Playing reasonable seldom is. But Yadav’s restraint does a marvelous job of balancing the trio’s chemistry. Amit Sadh shows his mettle through his metamorphosis from a secondary opinion to a furious figure. Often, the camera settles on his glimmering eyes to reveal a sensitive, complicated guy filled with a deep sense of guilt. Finally, there’s Sushant Singh Rajput as a 20-something father-figure to a boy he probably sees as a reflection of himself and wants to provide all the resources and support he never had. None of this subtext is ever mentioned. Like a seasoned actor, Rajput conveys it on his own. The young man has incredible energy but instead of blasting it out from all quarters, he patiently times it. The upshot is as graceful as Ali’s sixers. After showing immense promise in Rock On, when director Abhishek Kapoor decides to make a film on the novel ‘3 Mistakes of My Life’ which isn’t essentially amongst Chetan Bhagat’s most popular works, you have your doubts. However, on watching his compelling cinematic adaptation, one might want to reconsider the literary merits of Bhagat’s book. 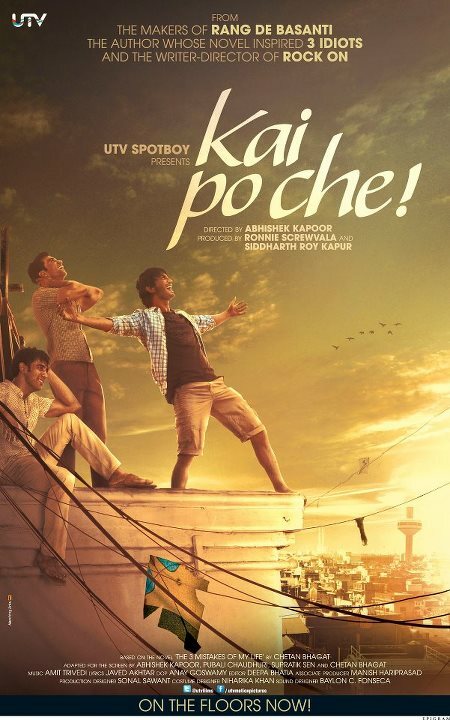 Kai Po Che is about three boys in Gujarat who are diverse in their aspirations but connected by their companionship. Govind (Raj Kumar Yadav), the most sorted of them, is working towards setting up a sports shop and takes tuitions in his free time. Ishaan (Sushant Singh Rajput) knows nothing other than cricket and wants to coach young talents in the game. Omi (Amit Sadh) is more or less aimless in life but gets his familial political connections to good use whenever and wherever needed. Through life’s ups and downs, their friendship is tested over troubled waters. At the core of it, the story is about friendship and the film celebrates it convincingly and capably. The camaraderie between the trio is never in the sugary sweet zone but is as pragmatic as possible. They abuse, beat and pull each other’s legs but are always there for each other. The characters are quickly introduced and established and the focus is more on their evolution. Scripted by Pubali Chaudhari, Supratik Sen, Abhishek Kapoor and Chetan Bhagat, while the storytelling is straightforward, the narrative is more spread-out like a novel and those uninitiated with the book won’t be able to predict where the plot is heading in particular, and thankfully so. Fortunately individual love stories aren’t designed for each male lead and the one clandestine romance track between Govind and Ishaan’s sister (Amrita Puri) is sweet and saucy at the same time. Their chemistry refreshingly builds up over maths tuitions and dandia nights over the usual running-around trees. With the Gujarat setting, the story is weaved around actual adversities like the 2001 earthquake or the 2002 Godhra riots, making the character conflicts in these catastrophes more relatable. Despite the propensity, at no point does the film become melodramatic, jingoistic or judgmental. The focus essentially is how their friendship is put to test in such circumstances and thereby the film steers away from any sermonizing yet it subtly makes you brood over the bloodshed. At a larger level, the film, in a very restrained tone, spreads the message of forgiveness, tolerance and acceptance without sounding preachy. Director Abhishek Kapoor’s biggest triumph is the fact that he is able to connect with the viewer. The story or storytelling might not be out of the box but he extracts perfect performances from the lead cast and ensures there is decent drama in the proceedings to keep you riveted. The boy-bonding is such bonafide that you rejoice for every victory of the friends and feel for them when they fall apart. The one moment where two estranged friends come together to share the excitement of India’s victory at a cricket tournament can bring a lump in your throat! Kapoor brings as much technical finesse to his film too. Amit Trivedi’s music has a pungent Gujarati folk flavor to it. Hitesh Sonik’s thumping background score adds immensely to the drama. Deepa Bhatia’s editing is crisp and Anay Goswami’s cinematography lends the requisite authenticity to the film. Despite three male leads, the roles are well-etched and no one overshadows the other. Sushant Singh Rajput as the rebellious young man makes a confident big-screen debut and is a complete natural. Amit Sadh shows good range, starting off as the carefree aimless youth and gaining depth and density towards the climax, expressing his internal turmoil through his bloody-red eyes. Raj Kumar Yadav as the more grounded and practical of the three, is restrained and impressive. The cute, chirpy and charming Amrita Puri makes her presence felt in this male-dominated drama. Manav Kaul is outstanding in the role of the fundamentalist politician. Kai Po Che (meaning ‘cutting the kite’ in Gujarati) cuts the clutter of conventional cinema thanks to its decent direction and persuasive performances. Certainly worth a watch!